At the Amazon Gold Box, there is a big gaming computer gear sale, with a total of 29 products, with prices ranging from $20 to $1600. This includes Acer, iBUYPower and CyberPower desktop computers, ASUS and Alienware laptops, Acer monitor, Ryzer and ASUS Prime, space-age routers, storage, gaming headsets, keyboard/mice, etc. Friday is here and this means we have a new round of Dell Refurbished coupons, running until Monday night as usual. The coupons cannot be combined with other offers or used on clearance items. Free standard US shipping. Apple Sale at B&H Photo: MacBooks, iMac, Desktops! For a limited time, B&H Photo is running an Apple sale featuring various MacBooks, along with Mac Minis, iMacs and iMac PROs, UFO cylinders, and more! If you are a fan of Samsung Chromebooks, a trio of their popular models are also part of the Computers & Tablet sales with the PRO (Intel) going for $360~ and the PLUS (ARM) going for $308~. Good until Saturday night, Gazelle offers $25 off all MacBooks at their website. No coupon code is needed. The discount appears automatically in their shopping cart when you add an eligible item. Free standard shipping with all orders. Another Woot Plus sale is in progress, these last longer than a day, this one in particular is good until 4/22/18. It is a MacBook AIR and PRO sale of Apple laptops with 17 laptops available and two having already sold out. Dell Refurbished is back with a 3-week promotion. A sale on Dell OptiPlex 7010 desktops is running with prices starting at $159 with free ground US shipping. No coupon is needed for this sale, but it cannot be combined with coupons or other offers. Most offers items are under $200. Sale ends 4/30/18 or earlier if sold out. Woot Plus, the longer running deals part of their website, has launched a handful of new offers today, headlined by the new condition YI Action Camera with Selfie Stick & Bluetooth Remote (US Edition) offered for $45 with free shipping for Prime or $5 flat for everything you buy during the calendar. Limit three per customer. It comes with a 90-day Woot warranty. Offer runs until 4/20/18 or earlier if sold out. They also launched a massive Business Desktops sale running until 4/17/18 at 4am central time. 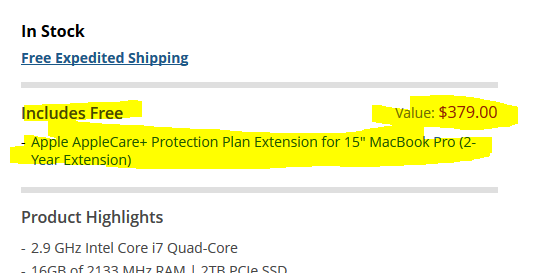 This includes some Dell Precision T-series desktops with Intel i7 processors. There’s also HP and Lenovo. There are over 40 options available! There’s also a refurbished laptops sale with 16 options available from HP only (Envy, Spectre, Pavillion, etc) good 4/18/18 at 4am central time. Dell Refurbished also has another coupon, running until 4/15/18 at 9pm central, 50% off any Dell Latitude E5440 Laptop using coupon E5440DEAL4U. Prices start at $179 after coupon. Free US ground shipping. Clearance items excluded. Remember, the clock is ticking on the various B&H offers if you want them to ship before they close for Passover 2018. The deadline is Thursday 7pm eastern. Among the latest offers running is FREE AppleCare+ Protection on select Apple MacBook PRO laptops. A total of six 15.4″ options are available with prices ranging from $2100 to $3300. Adorama is an authorized Apple retailer so you can buy without worry, and they have now launched a 48 Hour Apple Sale featuring sales on various iMacs and MacBook laptops of different screen sizes and configurations. Too many to list here individually. Dell Refurbished now has something for server fans! Coupon code DELLSERVER25 gets you 25% off any PowerEdge Server with free US ground shipping until 3/22/18 at 11:59pm central time. PS: speaking of time, “Spring Forward” is happening on Sunday, so adjust your sleeping patterns and clocks 🙂 Expect some blogging time-confusion on Sunday as I adjust! Another coupon promotion has been launched at Dell Refurbished, you can get 30% off any Dell Docking Station using coupon code DELLDOCK30. Prices start at $34. Free ground shipping. Cannot be combined with other offers. Expires 3/21/18 at 11:59 PM CST.